The Akrotiri Beach Hotel is a luxury 4-star hotel located on a peninsula overlooking the Agia Triada Beach in Paleokastritsa, Greece. 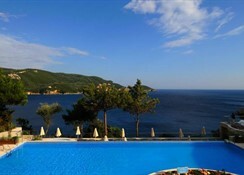 The luxury beach hotel has 125 sea-view rooms, overlooking the blue, pristine waters of the Agia Triada Beach. 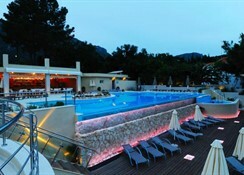 The hotel houses a large swimming pool with a kids’ section and is located 400m away from the Agia Triada Beach. The hotel has been tastefully decorated with light, soothing colours and wooden floors, giving the vibe of a relaxing beach vacation to the guests. 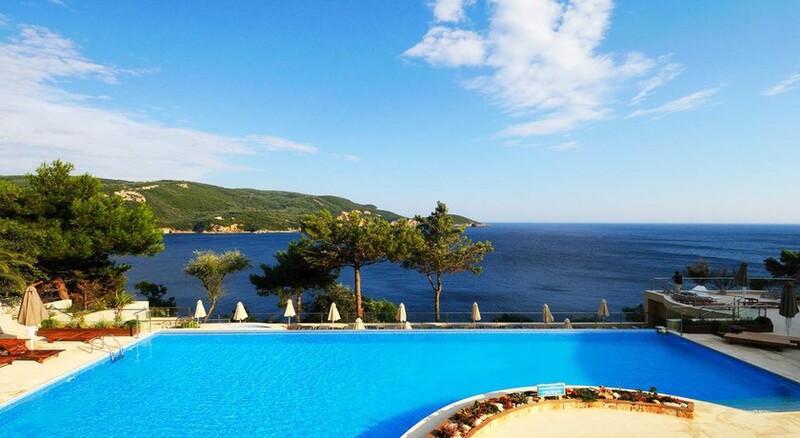 The hotel is about 22km away from the Corfu Old Town, which is a UNESCO World Heritage Site, making the hotel an ideal destination for vacationers looking to experience the rich heritage of Greek history and architecture. The Akrotiri Beach Hotel is located 23km away from the Corfu International Airport and the Ioannina Airport is 140km away. The Corfu Old Town, a UNESCO World Heritage Site, is 22km away from the hotel. Agia Triada Beach, which is the closest beach, is just a 400m away from the hotel. Apart from that, the popular Akron Beach Bar is located at a distance of 400m. Local tourist attractions like the Paleokastritsa, Glyfada Beach and the Aqualand water park are located within 15-20km away from the hotel. The hotel can arrange for cab for the guests’ local excursions. The Akrotiri Beach Hotel houses 125 sea view rooms that are classified into 5 types, based on size, amenities and number of guests. 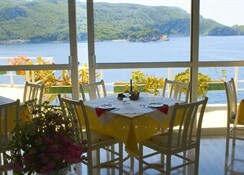 The rooms are Classic Sea View Rooms, Premium Sea View Rooms, Superior Sea View Rooms, Family Rooms and Panorama Suites. All the rooms are decorated with light, vibrant colours. The rooms are equipped with all the essential facilities like air conditioning, direct dial telephone, free Wi-Fi internet connection, 15" laptop sized safe, mini fridge, flat LCD satellite TV, shower, bathtub, hair-dryer and bathroom amenities. All the rooms have a private balcony. The guests can also avail an extra bed or a cot at an additional cost. 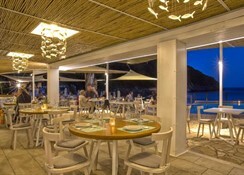 The Akrotiri Beach Hotel houses 4 restaurants and bars. The Dining Room serves American buffet breakfast and a 4-course dinner with a variety of International local Greek cuisines. Apart from that, the Main Bar serves a variety of local wines and signature cocktails. The bar also organises live entertainment shows with Greek music and dance. The Calypso Bar is the poolside bar that serves light meals, snacks and a variety of alcoholic drinks and signature cocktails. The hotel also houses the Akron Beach Club that serves snacks, lunch and dinner, prepared by Chef Kostas Soueref. The hotel is known for its romantic ambience and the sea view. 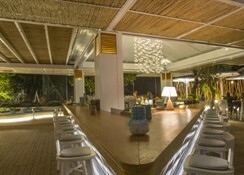 The Shoreline Beach Club organises Jazz Evenings. The hotel organises a variety of activities like Jazz nights, entertainment shows, music and dance nights, among others. Apart from that, the hotel’s proximity to the Agia Triada beach lets the guests indulge in water sports like diving, etc. The guests can also enjoy indoor sports like billiards, etc. Vacationers looking to spend quiet, relaxing afternoons can indulge in sun bathing on the beach or the sun terrace. The hotel houses infinity pool where the guests can have a great time. Apart from that, the Corfu Old Town is located 22km away from the hotel, where the guests can experience the rich heritage and culture of Greece.